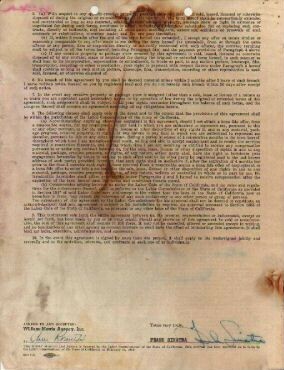 Note: This signed contract is stained and water damaged. 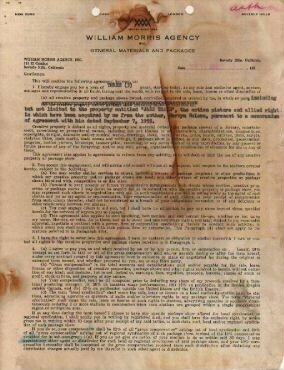 This is an authentically signed 8 1/2" x 11" double sided, William Morris Agency contract. The bad news is that the contract has been badly stained and water damaged. The good news is that the area around, and the signature itself are in good condition, with only the slightest bleeding of the ink. This document is dated September of 1955. Frank Sinatra hires the Agency for a period of three years. This contract also mentions the motion picture "Jazz Train" specifically. A historic piece of Hollywood history. As always we got to great lengths to bring you ONLY authentic material. In an age of mostly forgeries sold on eBay, we seek out only the most reputable sellers and sources of RARE authentic material.